At Habitat III, the United Nations Conference on Housing and Sustainable Urban Development, CSU participated in 2 panel discussions which focused on migration and refugees. The rapid increase of unprecedented numbers of migrants and refugees will put new pressures on the way towns and cities meet the challenges of rapid urbanization combined with resource stress and climate change. This panel will highlight the very positive role migrants and refugees play in sustainable urbanization, including worldwide case studies, best practices, and solutions on how to host, accommodate, and integrate migrant and refugee populations within existing urban contexts, as well as share lessons learned. Whether in camps, temporary housing, or in makeshift settlements, the need for access to public space, education and basic healthcare persists for migrants. These needs are just as essential for migrants as for inhabitants of any community or city, even more so for the former as they are more vulnerable. One could argue, in fact, that these are the very things that make a city livable, and are even more critical in such situations. Therefore, planning for long term, temporary, or emergency accommodations needs to pay particular attention to the physical and social needs as a way of starting the process of healing from a life of dislocation. Our panel discussed the opportunities, responsibilities, and obligations for the design community to respond to this global phenomenon, where there are more people on the move than ever predicted. What is the background reality, what are the new global realities, and the national, regional, and local implications for planning and design? Brown is an architect, urban designer, educator, and author. He is an ACSA Distinguished Professor in the Bernard and Anne Spitzer School of Architecture, City College of New York, CUNY. He was 2014 President of the AIANY Chapter and serves on the Board of the AIANY State. He is founding Co‐Chair of the AIA Design for Risk and Reconstruction Committee, and founding Board member of the Consortium for Sustainable Urbanization (CSU). He is the 2007 recipient of the prestigious AIA/ACSA Topaz Medallion. Mr. Liebman, FAIA, is a leading expert in the design of large-scale urban developments. His work is dedicated to issues of housing, lifestyle, and culture in the urban environments. He is currently a principal at Perkins Eastman, a leading global architectural and planning firm with fourteen offices worldwide. He is a board member of the CSU. Mr. Liebman is a past president of the NY Chapter of the AIA and an Adjunct Professor at NYU’s Urban Design and Architectural Studies Program. Ms. Helke has worked for IOM since April 1999 and is currently Director, International Cooperation and Partnerships, at IOM Headquarters. She worked in the Office of the Director General from 1999-2009 and was Chief of Mission for IOM in Sudan from 2009 to 2012. Before joining IOM she was in the British Foreign Service, serving at the Foreign and Commonwealth Office in London, the British Embassy in China, and the UK Missions to the UN both in New York and Geneva. Mr. Decorte is currently the Deputy Director of UN-Habitat’s New York Liaison Office. Previously, he was the chief technical advisor and the focal point for UN-Habitat’s crisis-related work in New York. He played a key role in developing an urban track towards the World Humanitarian Summit and the emerging Global Alliance for Urban Crises. He has worked for UN-Habitat for more than fifteen years in different capacities, including long-term assignments in Haiti, the occupied Palestinian territory, Somalia, and Morocco. He also acted as coordinator for UN-Habitat’s Global Disaster Management Program. The Chief Government Architect protects the architectural quality of the Dutch state property and their incorporation into the urban area as a whole. He is a Dutch architect, urban designer and former partner of Office for Metropolitan Architecture (OMA). He gives lectures and seminars at universities in the Netherlands, Belgium and France. In August 2006, Alkemade opened his own office and is currently director of FAA and FAA/XDGA. Mr. Weinreich is a partner at Ennead Architects, where his work on award-winning projects spans over 25 years. His efforts are also directed toward promoting an integrated practice of design excellence supported by technical innovation and a collaborative team-based project management culture. In collaboration with the United Nations High Commissioner for Refugees (U.N.H.C.R.) and Stanford University, Mr. Weinreich is currently leading the Ennead Lab research project Toward a Unified approach, developing a new methodology for the planning and design of refugee settlements. Ms. Djacta’s career with the United Nations began at the United Nations Development Programme (UNDP) in the area of public administration modernization and capacity development, with a focus on francophone Africa. She then joined UNHabitat, serving in various positions working on urban issues within UN-Habitat, in Nairobi as well as in New York. The CSU recently participated in meetings in three locations. 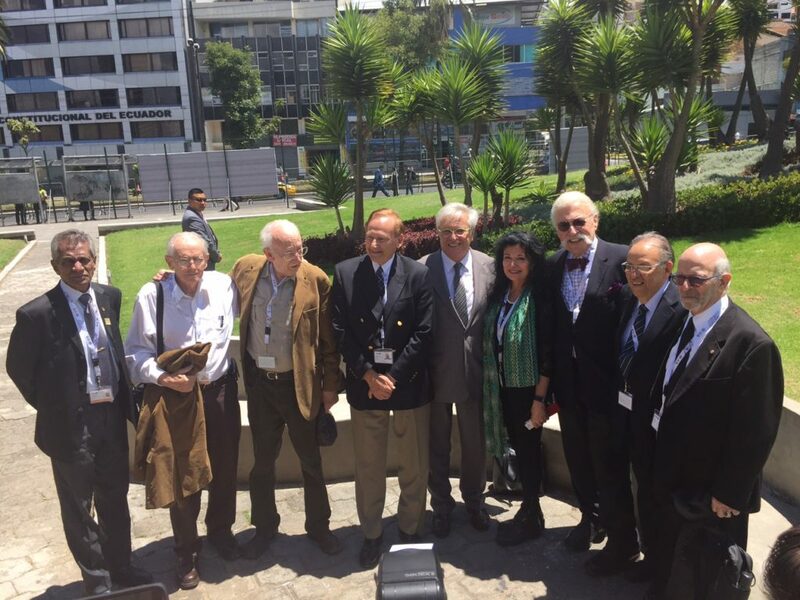 From October 14 to October 21 Lance Jay Brown and Ted Liebman were in Quito, Ecuador to participate in the UN Habitat III (HIII) meeting. Ted Liebman and Urs Gauchat were panelists on the CSU co-sponsored AIANY Design for Risk and Reconstruction Committee panel that Lance Jay Brown co-chaired and moderated; and Ted Liebman and Aliye Celik participated in the UN New Urban Agenda implementation meeting at the UN on October 25. 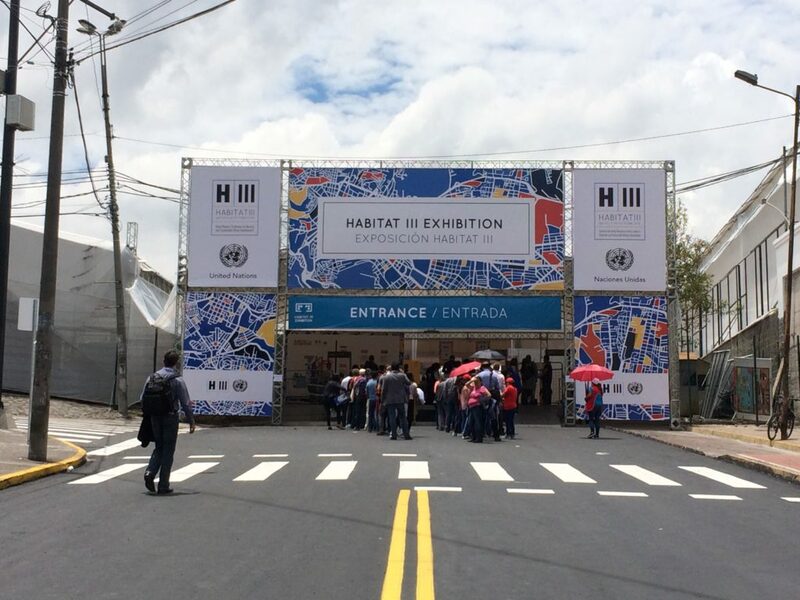 The Habitat III meeting in Quito, the United Nations Conference on Housing and Sustainable Urban Development, is the third UN meeting in 40 years to discusses the status of our urbanizing world, illuminated the hierarchy of issues facing humanity, presented policies and actions in response to these issues and, by all accounts, was a very successful conference. As noted by Citiscope news, nearly 50,000 people came to Quito for HIII. World leaders, Mayors, NGOs, universities, research centers, and others organized 1,000 events on topics ranging from world economy and world ecology to migration, refugees, and sea level urbanism. The CSU organized one Next City World Stage Event on Migration and Refugees for one audience of 100 and another event, a UN Side Event, for another 200 person audience. The World Stage event was organized by Next City President Thomas G. Dallessio AICP/PP. Information about the World stage events can be found at https://nextcity.org/habitat3. Both the World Stage and UN Side Event events reprised our 18 May event at the UN ECOSOC chamber. In the end we saw that Refugees and Migrant issues were discussed more widely at Habitat III than previously predicted or announced. In addition to Lance Jay Brown and Theodore Liebman the CSU programs included the following participants: Floris Alkemade, Chief Government Architect, the Netherlands, Filiep Decorte, Deputy Director, UN-Habitat New York Office, Don Weinreich, FAIA, ENNEAD Lab (UNHCR-Stanford Project), and Ms. Jill Helke, Director, IOM International Cooperation and Partnerships Division. Major issues addressed in Quito included the important, overriding leadership necessary at the local level if the principles of the UN New Urban Agenda and the accompanying Sustainable Development Goals (SDGs) are to be implemented. National and regional policy will continue to be critical as will global economic support but it is at the local level and with the involvement of urban communities that positive change will take place. Climate change continues to be the prime global concern and the attendant issues of sea level rise, drought, agriculture, potential conflict, extreme heat and others were addressed by many of the HIII meetings. Plenary sessions brought together different categories of leadership and sought agreement on policy papers that had been developed in the prior years preparatory meetings. 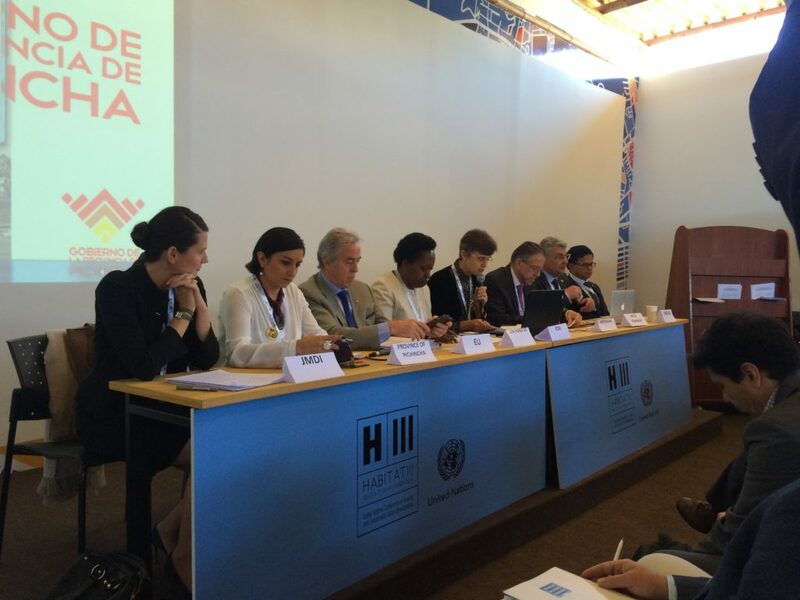 The participant’s agreement and the signing UN New Urban Agenda was the closing highlight of the HIII meeting. The NUA is presented below in its entirety. There were both accolades and criticisms of the NUA. For many it did not go far enough but for others, ourselves included, understanding what it takes for 193 nations to agree on general principles includes accepting a level of compromise. While aspects concerning the rural poor, representation from the private sector, and specific plans for cities were seen as too absent, specific NUA language about the role of families, the right to the city, and integrated urban planning were applauded. In a parallel celebration Habitat III Secretary-General Joan Clos was presented with the first internationally awarded Jane Jacobs Medal for his leadership and we were gratified when he publicly acknowledged that it was the CSU that nominated him.